Wow, it’s 2015!!!! So much to do, so little time! I’ve planned many projects for this year, completing UFOs, learning to use my new to my CSMs (Circular sock machine), improving my long arming skills, learning to design patterns, using my stash, eating healthy, and organizing. But most important activity to do is to attend QUILTCON, 2015!!!!! Super!! I will be busy at my very first QuiltCon which will be taking place in Feb. Fortunately I got registered for 4 , yes 4 courses!!! and of course the lectures as well. This will be very exciting, my first ever quilting conference! The doll applique is an image from the print fabric used to make the chevrons. Now to decide on how to quilt the quilt! A lap size dresden plate quilt. 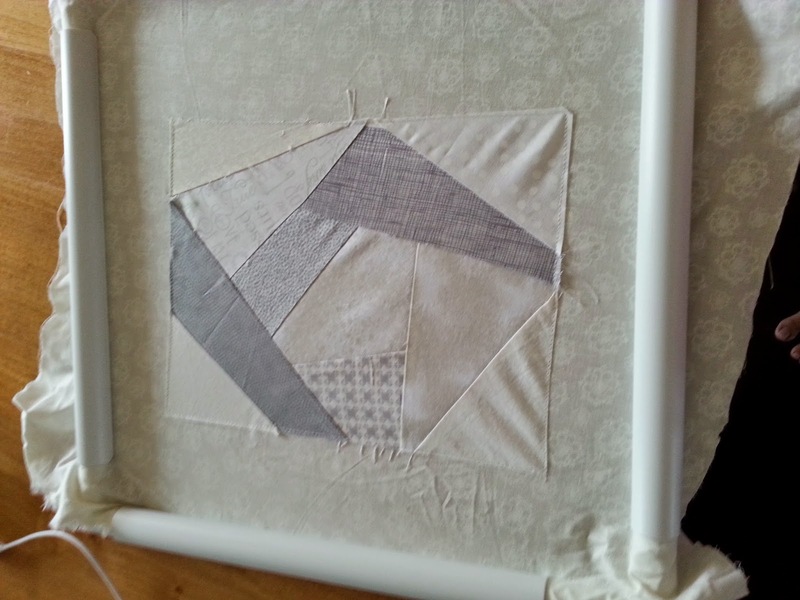 Practise, practise, practise on this quilt…I call it bonding with my machine moment! I was practicing McTavishing quilting, freehand, using rulers etc….well I definitely need more practise! Bonnet Ties quilted completed using modern fabrics. 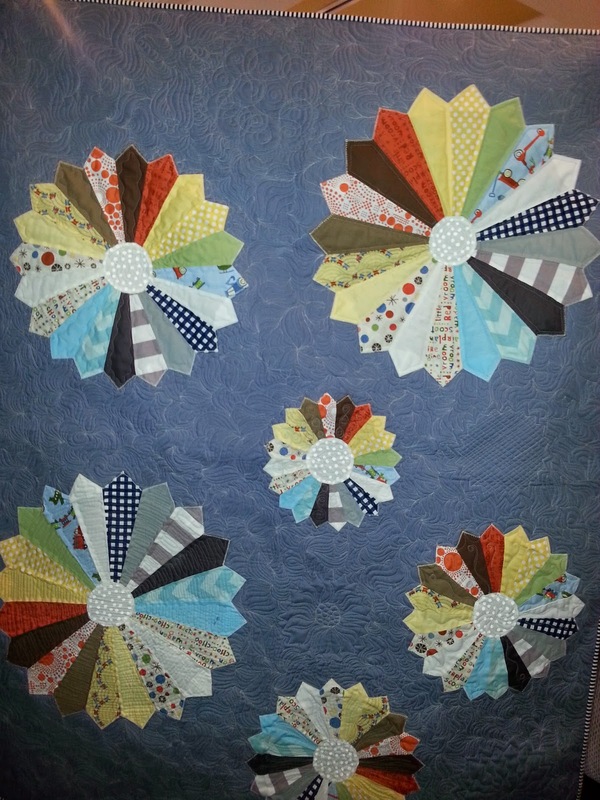 The quilting on top was inspired by Crazy Mom Quilts blogspot. The back fabric was bought from IKEA. Looks cool as backing for quilt don’t you think? I enjoyed making this quilt tremendously, despite taking much longer that I thought it would to piece the small blocks. 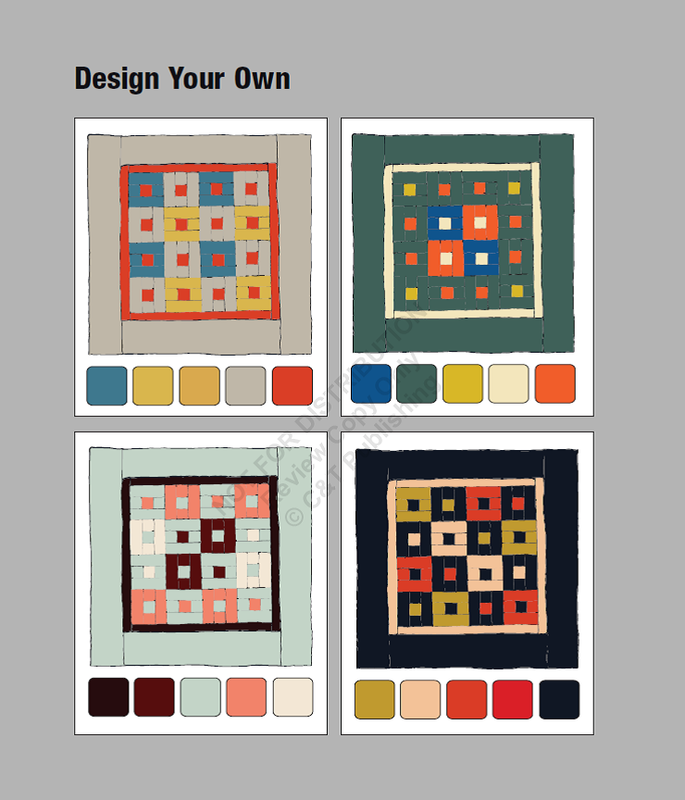 Are you into creating miniature quilts, well this book may be for you. 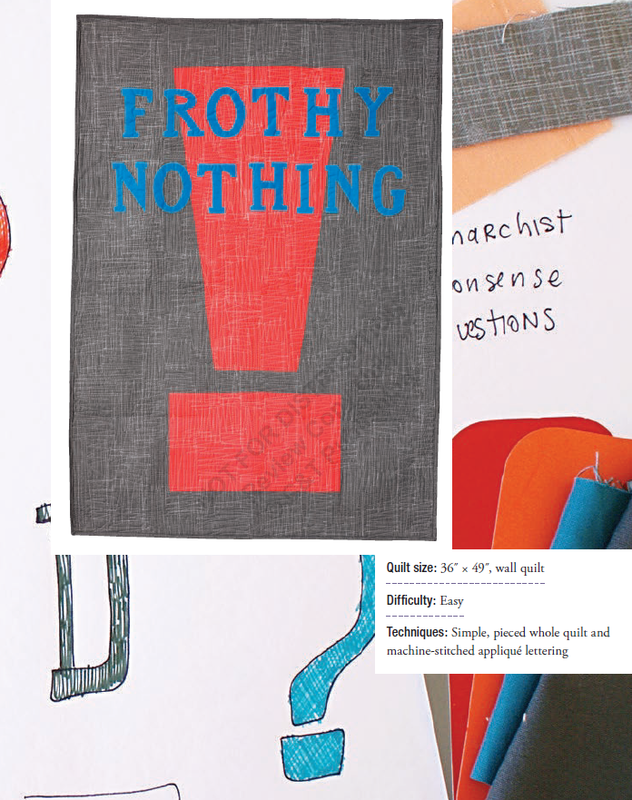 This book is comprised of 17 projects made from scrappy reproduction prints. This is Carol Hopkinssecond book on Civil War Quilts. Carol Hopkins has designed many quilts using reproduction fabrics. Most of the quilts are small approximately 28 inches by 34 inches, block sizes average 3 inches. Two quilts are of medium size, 51 inch square, and 44 inch square, respectively. Each quilt has detailed instructions on how to piece the blocks. A brief introduction related to the Civil War describes the quilt pattern in each chapter. With no previous experience in making miniature quilts, I decided that I would review this book and create a miniature quilt. I chose the Bonnet Ties quilt pattern. The quilt measures 27” by 33”, and the blocks are 3”by 3”. This was also the first time I constructed the pinwheel block. Fabrics used in my version of the quilt were from the modern trend versus the reproduction fabrics used in the book. The vibrant modern colours gave the quilt a different feel about it. Lesson learned during the quilt making process is that miniature quilts take much longer to quilt than bed size quilts, and there is no room to make mistakes! 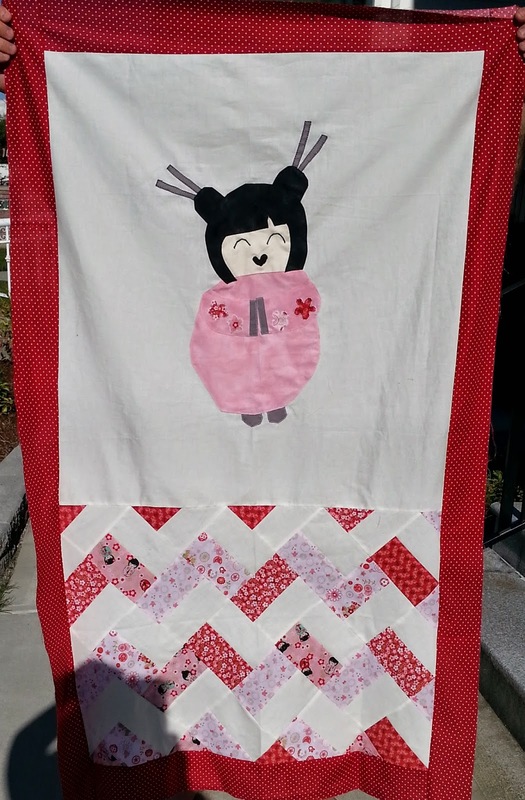 After all blocks were sewn together, the quilt came to life. 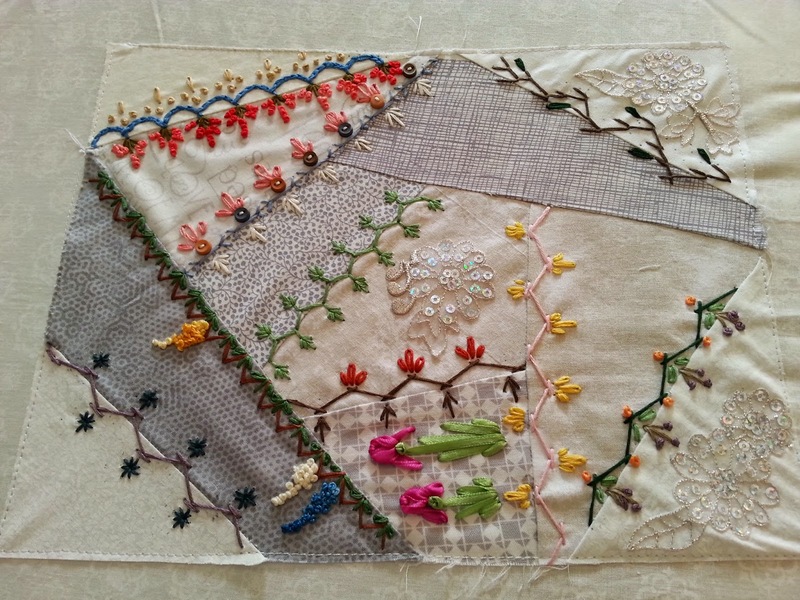 The attributes of vintage quilts change when using modern fabrics instead of reproduction fabrics. So, if you would try a hand on miniature vintage quilts with a modern flair, this book may be for you! Yes!!! Finally completed my Crazy Quilt block!! That was a fantastic class, I learned so much about embroidery. I sure have come a long way from the basic straight, chain, and blanket stitches. All I need to do is frame the block…awesome! 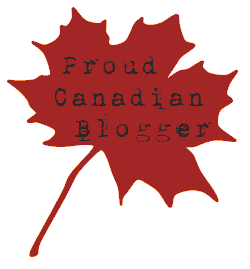 A big thanks to Kathy for offering the online course! 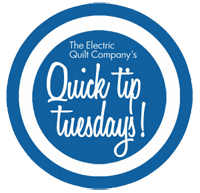 Here’s an excellent video on needles and threads, posted by Handi Quilter!!! 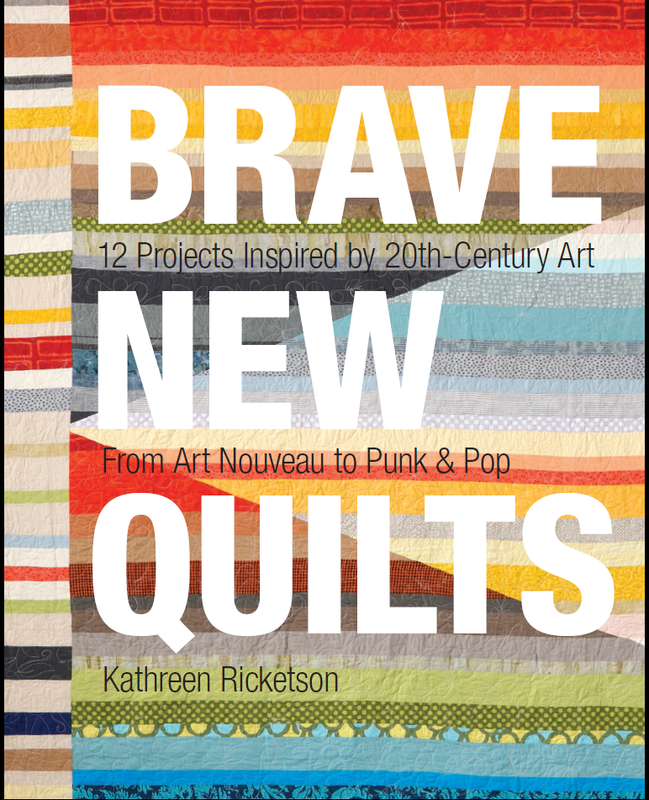 Brave New Quilts by Kathreen Ricketson, features many informative articles related to the basics of quilting from colour theory, fabric choices, and how to design quilts using modern techniques. The author incorporates modern art in designing the 12 modern quilts offered in this book. 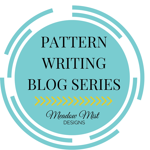 A brief note on each artistic period is outlined for each pattern. I recommend this book to all quilters, and readers alike, if you enjoy creating quilts with an out of the box flair. For those that have difficulty in choosing colour combinations, myself included, many colour schemes are shown in each project. This Peacock Blue quilt is one that I aspire to make eventually, amongst all my other quilting projects! 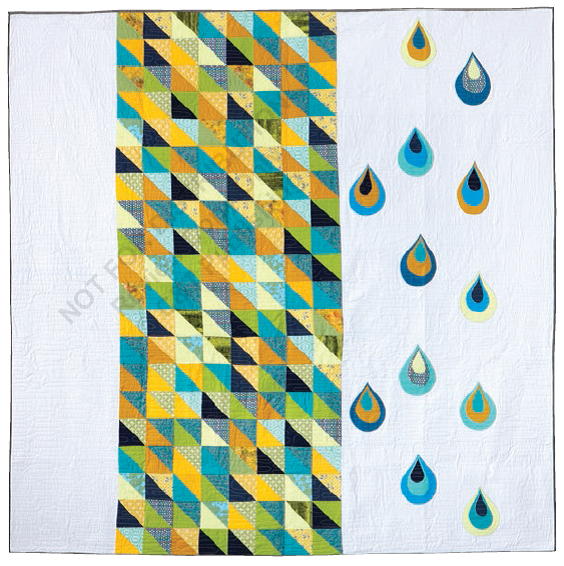 I love the different shades of blues and ambers in this quilt. There is an ample amount of negative space for quilting, yes! Using texts in quilts, I have a special person in mind for creating a quilt with words. The author teaches us how to design, and personalize text quilts. Colour play, design play, and word play are just some of the exciting features of this book. I hope you get inspired and create with this brief book review! This is one of my favourite classes to date. I am learning various techniques in this class. The only stitches in embroidery I knew prior top this class was the blanket, chain and straight stitch. Now I know how to stitch the French Knot, my favourite thus far, and how to use ribbon to create flowers. Here’s my before and after block. Palette is a mix of shades of greys, cremes, light brown and white. I still need to complete a couple of stitching rows, add some beads and finish roses. My absolute favourite stitch learned from the class is the French Knot. I also enjoyed working on the iris and cannot wait to start the roses, but I will need to complete the embroidery first. Sure wish there was enough time in day to work on all my projects! !